This had to be one of the most aesthetically pleasing packages I've seen, which is honestly part of the reason I picked it up. 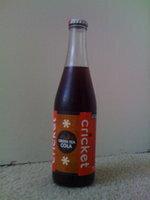 That and I actually wanted to enjoy the beverage of choice this week so I played it safe with cola. My theory was correct as I found another winner. The box exclaimed "Cane Sugar. Kola Nut. Green Tea." How could this not be good? In fact, it also stated "Expect this to be good." Sold. This cola, in comparison to the ginseng cola I reviewed not too long ago, is more of a Coca-Cola rather than an RC, which is okay, although between those two I'd prefer RC. It's hard to explain but there's almost a lemon-tea flavor going on in the background. I guess that should be easy to notice considering lemon cola exists, but honestly I think it's just the crispness of the cane sugar along with the subtle green tea in the background. Green tea is the third ingredient, even above that "less than .5%" of kola nut, so this is more of a green tea soda than a cola, so you will taste it. Being a green tea fan, that's a very good thing. Whatever it's boiled down to, it's delicious. Easily as good as ginseng cola, but quite different.